It may smell like old socks, but a PhD-project at the Norwegian University of Life Sciences (UMB) reveals the traditional Norwegian cheese «Gamalost» has a range of health benefits. 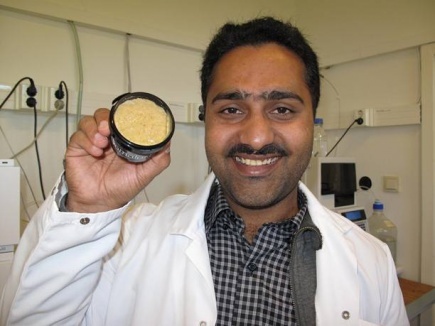 Pakistani Tahir Mahmood Qureshi conducted his PhD-research on the traditional Norwegian cheese Gamalost, a hard crumbly cheese with a very sharp, intense flavour, and found it contains substances which can help keep your blood pressure low, your bones strong and may even help prevent cancer. Gamalost is made from skimmed milk and contains substantial amounts of peptides. Some peptides have a blood-pressure-lowering effect and are, as a result, good for your health. Qureshi has investigated the maturation process of the cheese; how it is processed by the digestive system and what happens to the peptides in the stomach and the intestines. «Through in vitro-models we see that the activity of these blood-pressure-lowering peptides increase when travelling through the digestive system and also increase in numbers in the intestines. We have researched how these peptides develop in intestinal juice from human beings and observed a further development of these healthy peptides, » Tahir Mahmood Qureshi at UMB explains. «In vitro » generally refers to the manipulation of organs, tissues, cells, and biomolecules in a controlled, artificial environment. While working on his PhD-project, entitled «Health aspects of the Norwegian autochthonous cheese Gamalost: development of bioactive compounds during ripening and digestion», Qureshi also discovered that Gamalost contains substantial amounts of vitamin K2, which is beneficial for the bone structure and heart and has been proved to prevent cancer. «If you like to spread a thick layer of butter on top of your Gamalost, I am pleased to inform you that there is little reason to stop doing so,» Qureshi smiles. «Surveys show that Vitamin K consumed together with fat, is easier absorbed to the bloodstream and offer further health-inducing effects, » he continues. Cheese which smells strongly and has a strong taste may contain biogenic amines to a greater or lesser extent, depending on which microorganisms are present in the cheese. Biogenic amines arise when proteins are transformed to amino acids, which again can be transformed to biogenic amines. These can be very damaging to human beings, and can cause headache, nausea and perspiration. «If you feel in bad shape after an evening with cheese and wine, it is not necessarily the wine which is to blame, says Professor Siv Skeie, Tahir Mahmood Qureshi's PhD-tutor. – It can just as well be a result of substantial amounts of biogenic amines from the cheese,» she continues. «Gamalost contains insignificant amounts of biogenic amines, » he says. Qureshi has now finished his four-year-long stay in Norway and has recently gone back to Pakistan where he will continue his research on food-related health aspects, particularly cheese. The products he will be working with in the future will be more traditional Pakistani ones, but the technique is the same. However, whether his suitcase will contain Gamalost is not part of this story.